As the old saying goes, "Go big or go home!" In the wild world of stuffed animals sometimes bigger is better. That's why the Jumbo Lying Stuffed White Tiger Plush Animal by Fiesta is so exciting. Measuring thirty-two inches from nose to tail, this jumbo lying stuffed white tiger is the kind of stuffed animal you can really wrap your arms around. Covered in durable plush faux fur and stuffed to the max for superior softness, this jumbo lying stuffed white tiger is perfect for play or to rest your head. Adorable is in no short supply with the Jumbo Lying Stuffed White Tiger Plush Animal by Fiesta. 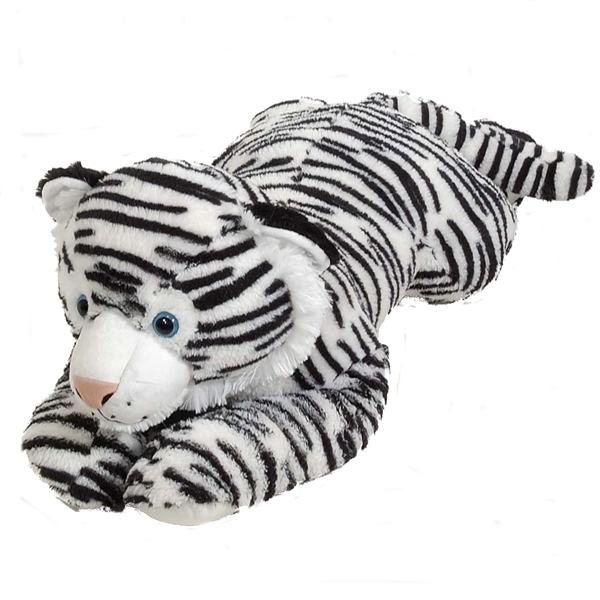 Its cute and cuddly features make this jumbo lying stuffed white tiger impossible to resist. One look into the eyes of this jumbo lying stuffed white tiger and you'll fall in love. But just when you thought it was too good to be true, it gets better. Fiesta has an entire line of Jumbo Lying Stuffed Animals. Collecting them all is the next best thing to having a zoo of your very own. So what are you waiting for? For over 40 years, Fiesta Toy has been one of the world leaders and innovators in stuffed animals and plush toys. Their wide assortment of traditional and unique stuffed animals inspires creativity and imaginative play. Fantastic products like this jumbo lying stuffed white tiger allow children to share in the magic of the animal kingdom and learn more about the fascinating creatures that inhabit and share our planet. The Jumbo Lying Stuffed White Tiger Plush Animal by Fiesta is made with all new, child safe materials and meets or exceeds all U.S. safety standards. Recommended for ages three and up, we suggest surface washing for this jumbo lying stuffed white tiger plush animal.